I have Sound Balster Z and SteelSeries Siberia 800 headphones. Both support Dolby Digital Live encoding. I have connected the Siberia's base station using optical cable to the Sound Blaster's S/PDIF output. 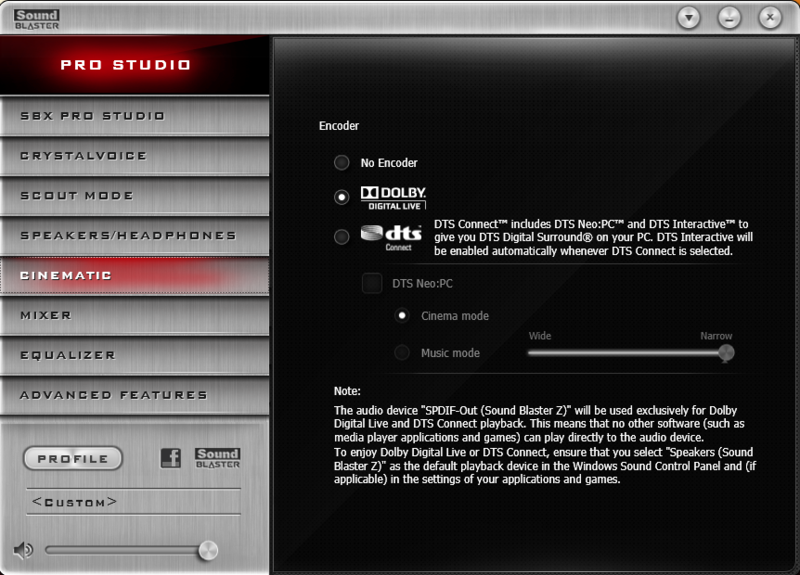 I also have the option to turn on "Dolby" in the Siberia base station options. Alternating between the two options produces (subjectively) different sounds. Turning both on at the same time introduces crackling in the background. I was wondering if anyone could explain whats going on and what are the proper settings for DDL and headphones connected through S/PDIF? First off: I was not able to find proper specs or even a manual. So most of this is based on what’s “normal”. It most likely also has a Dolby Pro Logic decoder. This is what you toggled. As such, you must activate Dolby Digital Live on your sound card. Otherwise, it will continue to output stereo over its digital outputs. Not the answer you're looking for? Browse other questions tagged audio sound-card headphones dolbydigital or ask your own question. How to add back disabled audio devices? How to control Creative audio card from Windows mixer?